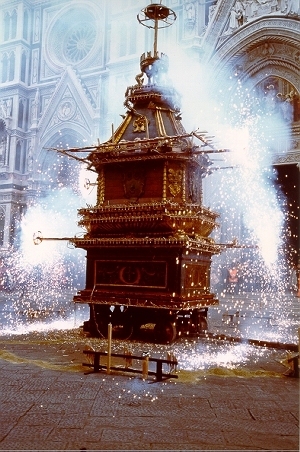 Every year the Saturday of Passover, Florence accommodates the Explosion of the Wagon. 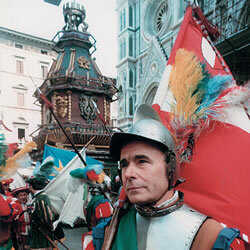 E' a tradition that rifares to the first Crusade, where participated, guides to you from Pazzino di Ranieri de' Crazy. The 15 July 1099, after along I besiege, the crossed army conquered Gerusalemme; for the enterprise, Pazzino, received in gift from Goffredo IV duca of Buillon (said Buglione), of the Lowland Lorena, three stone flakes of the Sepolcro saint di Christ, then gelosamente guarded and capacities to Florence in 1101. Conserved at first from the family Crazy, the three stones were used in order to create one then fire spark “novello” (paschal symbol all of new life) distributed, after the blessing, to the single families in order to relight the domestic hearth. The use, begun to Gerusalemme is diffused therefore to Florence during the Crusades, to distribute to the clergy and to the people the “Saint Spirit”, sign of the Risurrezione di Christ. Subsequently the Ceremony has become symbolic, and hour Sunday of Passover, a great Wagon, than it is rifared to 18° the century, adorned with festoni, comes transported from buoi white men and it parades along the ways from Door to Prato, where it remains the others 364 days of the year, until the public square of the Cathedral. A thread of steel the colleague to the altar of the cathedral. During the Putting of noon, in the moment of the Alleluia, the Archbishop ignites a rocket to dove shape (that he remembers the created Saint fire for means of ancient stones). The rocket comes down talked nonsense through the thread until to the artifice fire Wagon, imbottito, that it explodes therefore for the great great joy of the spectators. The tradition wanted that if the colombina did not arrive to the wagon it showed a bad year for the collection. Today bond or bad one is interpreted like sign of auspice for the city of Florence.